Heath travelled to the Saffrons on Saturday and made a shaky start when in just the second over of the day the prize wicket of Jonny Phelps was grabbed by Jon Purdey off the bowling of Ben Hacker. Callum Smith joined Chris Blunt at the crease and the pair moved the score on to 46 before Smith (15) was trapped in front by Richard Smith. Heath number four Tashaffi Shams became Smith’s second scalp as he edged behind in the same over to leave Heath wobbling. Ollie Bailey looked to soak up some pressure but was undone by a good delivery from Smith, and when Blunt (44) lofted a drive to cover just a few overs later Heath were right up against it at 78 for 5. Fortunately for Heath the middle order fired in style, sparked by 15 year old debutant Ben Matthew, who steadied the ship by batting for 13 overs - which was far more valuable than the 9 runs he scored would indicate. While Matthew was at the crease Matt O’Keeffe had made a positive start to his innings and when he was joined by Tim Upchurch the Heath innings was reignited. Upchurch played with great intent against the Eastbourne spinners, playing a number of slog sweeps and lofted shots down the ground before being run out for 45 thanks to a fine throw from the deep by Stuart Tibble. Having rotated the strike nicely throughout a mature innings of 51* O’Keeffe and the tail took Heath up to 200 for 9 when a declaration came. Smith was the pick of the Eastbourne bowlers with figures of 4 for 53 from 15. Eastbourne opener Purdey got Eastbourne off to a quick start but a sharp piece of work from Smith got Heath their first breakthrough. Distracted by an lbw appeal, Walter Huchu was out of his crease when the ball deflected to Smith at slip who threw down the stumps to run Huchu out. David Everett then found the edge of number three Chris Borsoi to reduce the home side to 39-2. Purdey continued to play fluently and moved the score to 82 before Josiah Menzies triggered a middle order collapse by taking the wicket of Michael Pannett (17). 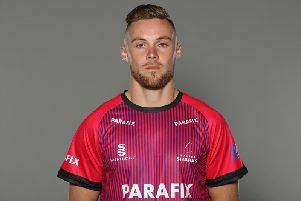 In the next over the league’s leading wicket taker Ollie Bailey came into the attack and made an immediate impact by taking two wickets in two balls to dismiss Purdey (61) and Henry Smith. Menzies and Bailey were at it again a few overs later with a further wicket each in consecutive overs, removing Trubshaw and Richard Smith. At 110-8 the game looked to be heading to a swift end but number 10 Joe Barnett decided to take the attack to Heath and put on 45 with Stuart Tibble. Tibble was dismissed by skipper Smith who then wrapped up the win with 5 overs to spare by bowling number 11 Ben Hacker. This was a fine comeback victory for Heath against a strong Eastbourne side who finished 168 all out in the 43rd over.